Note: Please call each site directly to make an appointment or to inquire about availability. Click here to download a non-fillable pre-application. Please return the pre-application directly to the property you are applying to. Click here to download a fillable pre-application. 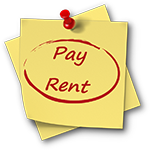 Click here to download a full list of rental properties (PDF). Managed by Peoples' Self-Help Housing, this 100-unit affordable rental housing development features units varying in size from two to four bedrooms for families earning a substantial portion of their income from agricultural employment. The Rancho Sespe Workers Improvement Association Corporation owns this property. This 1927 Spanish Colonial style hotel located downtown was carefully restored retaining its original architectural features. Each of the 41 furnished rooms have a bathroom with shower and kitchenette. Amenities include outdoor courtyard with fountain, community kitchen and lobby. For more information about this property and to inquire about availability, please Click Here. PSHH closed escrow on the El Patio Hotel, 167 South Palm Street in downtown Ventura, on December 31, 2009. The 44-unit single-room-occupancy hotel is being remodeled with completion estimated for March 2011. The front of the hotel is being refurbished while current tenants are residing in the other half of the hotel. New room additions include a community kitchen, wheelchair lift, two handicapped accessible rooms, as well as improved parking, building exterior, landscaping, fire sprinkler, new plumbing, heating and electrical systems, and a Photovoltaic Solar system on the roof. The hotel will serve low-income residents; 16 rooms are set-aside for formerly homeless individuals referred by Ventura County Behavioral Health Department. Since purchasing the Hotel, Peoples’ has brought in supportive programs for the existing tenants. PSHH social workers visit the property regularly, and Food Share of Ventura County is now helping to distribute food to the low-income residents. 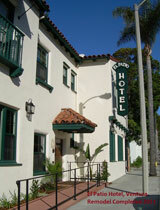 The El Patio Hotel is a classic Mission-style hotel built in 1928. The renovation will retain the original architectural aspects of the building. Project architect is E.C. Lind, LLP; interior designer is Adele Rosen. PSHH construction superintendent is Jim Hurst and project manager is Brad Stevenson. Michel Colmache continues as the on-site property manager, a position he held for 16 years with the previous owner. The 11,741 sq. ft. renovation will preserve the hotel’s original glass and brass hardware, vintage skylight, and hallway door glass transoms. “We are restoring the original character of the hotel to show it as it was built in 1928,” said PSHH project manager Brad Stevenson. "The El Patio Hotel has been operating as one of the few options for affordable housing in the downtown core of Ventura for over 20 years. Several of the current occupants, including the on-site manager, have been residents of the Hotel for many years. Many are seniors on fixed incomes, others work in the downtown business corridor," stated Executive Director Jeanette Duncan. Financing is provided by Santa Barbara Bank & Trust, City of Ventura Redevelopment Agency & HOME Program, County of Ventura, California Tax Credit Allocation Committee (American Recovery Reinvestment Act of 2009), voter-approved Proposition 1C Housing and Emergency Shelter Trust Fund Act. Peoples' Self-Help Housing is an equal opportunity provider and employer.